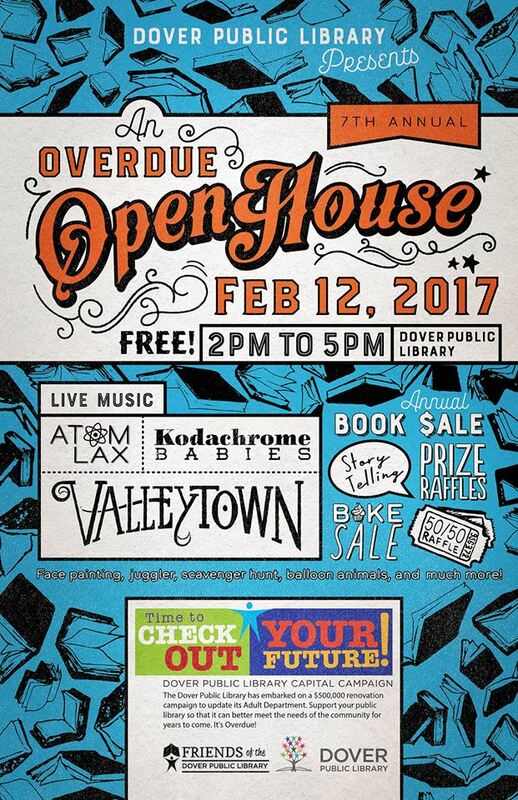 We’re back for the 7th Annual Overdue Open House at the Dover Public Library on Sunday, February 12th! Come to the library between 2:00 and 5:00 p.m. for great fun for the whole family! This FREE event will feature a huge bake sale, prize raffles, a book sale, facepainting, a scavenger hunt, balloon animals, storytelling, a juggling show, and live music by the Kodachrome Babies from 2:00 to 2:45 p.m., Atom Lax from 3:00 to 3:45 p.m., and Valleytown from 4:00 to 4:45 p.m. It’s gonna be so much fun! Hope to see you there!